Hello everyone, today I have for you a new free printable party set just in time for Thanksgiving! 7x9 inch Banners - Cut out and hole punch near each edge at the top. Weave ribbon, twine, string, yarn, fishing line, or whatever you have on hand through the holes to make a banner. Affix to wall with tape or thumbtacks, depending on how heavy the banner ends up being. Includes A-Z, a turkey image banner, and a blank banner. 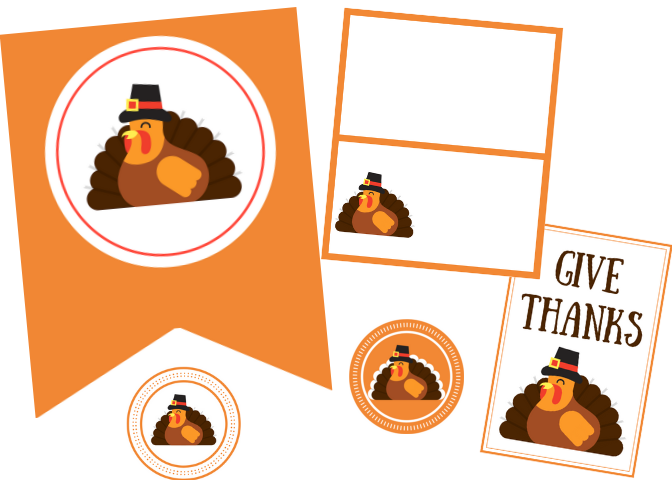 2x3 inch rectangular give thanks tags - Cut out around edges and hole punch near top. Weave ribbon or twine through the hole and tie to napkin ring. I hope you all enjoy this printable set and have a wonderful Thanksgiving. You can find more of our free party printables here. I’ll be coming out with lots of winter holiday printables soon!